The Boss BCB-60 Pedal Board is the perfect way of setting up and transporting your compacts, stompboxes and twin pedals in a secure case. Whether you're a bedroom guitarist, a budding amateur who is jamming with mates, or a seasoned pro who gigs regularly, the BCB-60 enables you to store your pedals neatly when not in use, gives them the exact amount of power they need when you're performing, and provides a tough protective housing when you're on the road. As we've all come to expect from Boss, their gear is built to withstand all the knocks that come as standard with life on the road. However, although it is as tough as they come, the team at Boss have made it incredibly lightweight and easy to travel with. The lightweight design is particularly useful for gigging musicians, who must ensure that excess weight is kept down to a minimum. The unique padded interior can be customized to fit a range of gear, while a convenient AC adaptor supplies power for up to seven devices. 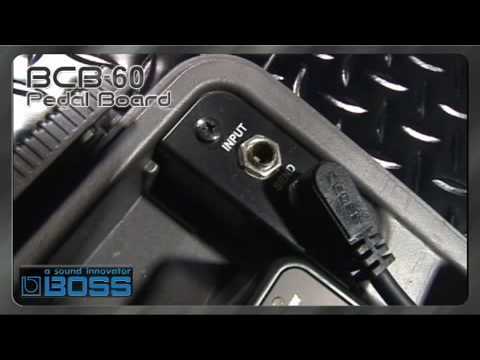 No matter what kind of pedals you have, the Boss BCB-60 can store them. The customisable interior comes with three foam inserts pre-cut to hold your favourite BOSS gear, plus a spare insert that can be cut to fit almost any effect-even from other manufacturers. Create the ultimate pedal board using compact pedals, Twin Pedals, a tuner or even a V-Wah. The Boss BCB-60 does. In fact, the onboard AC adaptor is almost like a mini electrical generator, giving you up to 1,000mA of power, or the equivalent of five PSA-Series adaptors. Now you can run up to seven devices right from the pedal board. With the Boss BCB-60, there has never been a more convenient way to organize and transport your gear. Posted on 25/01/2016 by Jamie Great Pedal board this, have this with my Wah, fuzz & distortion pedals set, none of which are Boss products and this works perfectly with all of them & powers them up as I would hope for, if your looking for a great conveient pedal board with minimal messing this is the perfect board for you as it even keeps all your pedals locked in nicely when not in use!